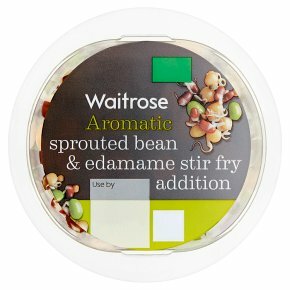 INGREDIENTS: sprouted adzuki beans (28%), sprouted chick peas (28%), sprouted lentils (20%), edamame beans (soya), onion, coriander. Stir fry 3 mins. Time: 3 mins. Remove all packaging. Heat dry wok for 1 minute 30 seconds. Add 1 tsp of oil and add vegetables. Stir fry over a high heat for 1 minute 30 seconds, stirring frequently, until piping hot. Serve immediately.